The best fire starter in a survival situation is char cloth. It holds a flame longer than a match and once you’ve got it going it’s easy to light a bigger fire by feeding it . Plus it’s super easy to make your own so you’ll never run out. Make it and keep a tin of it in your gear and in your bug out bag. It could save your life. Char cloth is the best fire starter. It is a slow burning cloth that’s been carbonized to give it a very low burn temperature. Char cloth holds a flame for a long time, unlike a match or a flint, which is short-lived. Once you’ve caught a spark on a piece of char cloth you can feed it with tinder to get a cooking or heating fire going, even when it’s cold and damp outside. Are you ready to learn the easy way to make the best fire starter? While you have your wood stove going this winter. Grab an Altoids tin and some fabric scraps of cotton or linen and make a few cans of char cloth for your emergency kit. That’s all you need to make the best fire starter. And it really is that easy. Char cloth is used to make a fire without matches. Char cloth will burn from a few sparks made with a flint and steel, through friction, or through a magnify glass and sunlight. And it burns for a relatively long time, giving you time to feed it with tinder, like dried grass, leaves, and bark, to get a fire going. Matches just don’t stay lit long enough outdoors to get a good fire going with the available tinder – especially when it’s damp and cold. 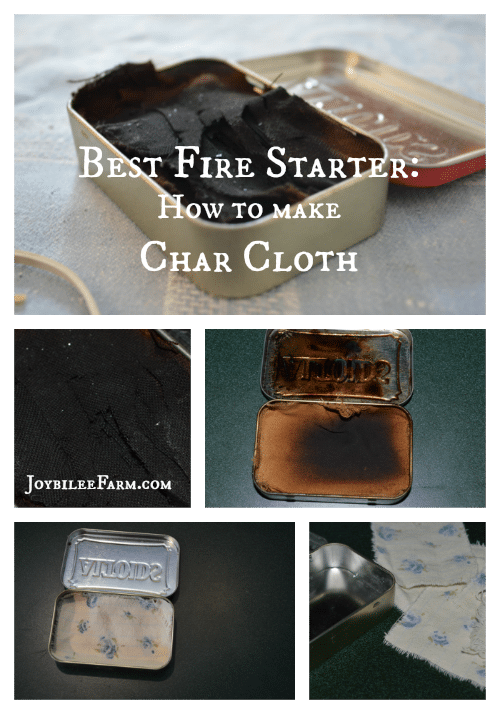 Keep [a fire starter kit in your emergency kit and include char cloth. Make your char cloth in the winter while you are heating your house with wood. To make it you’ll need an altoids tin, a nail and hammer, and several pieces of cotton from a torn flannel nighty, a t-shirt, a worn sheet, some old clothes, or even fabric scraps. Make sure the fabric is 100% cotton, linen, or hemp. It needs to be a plant fiber for the pyrolysis reaction to work. A manmade fiber will melt and a protein fiber like wool or silk won’t have the same chemical reaction. 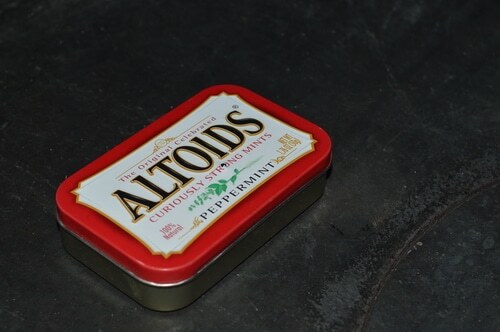 Poke a tiny hole in the top of the altoids tin with your hammer and nail. This is to let the combustion gasses escape. 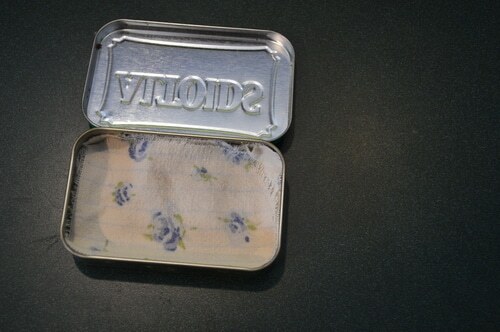 Cut several pieces of cotton to fit inside the altoids tin. They can be any size from an inch square to the size of the bottom of the altoids tin. These will be the finished sizes of your char cloth. Don’t make them too small as you want them to hold the flame long enough to catch your available tinder on fire. Most instructions on the internet tell you to build a fire and put the altoids tin directly into the coals and watch the gases escape. But you need to stop the pyrolysis when you see the gases stop escaping from your tin. This is awkward if the tin is inside your firebox. On the other hand, you can place your altoids tin on top of your wood heater or wood stove and make the char cloth on the top of your woodstove. It takes a little more time, but you aren’t in a hurry. Just put it on the back of the woodstove and keep it there until the process is finished. The gases that escape have a sweet smoky smell. Have good ventilation in the room when you do this. There isn’t enough smoke produced to actually set off a smoke alarm. (Note: if you have asthma don’t do this indoors, it could trigger a reaction). Put your prepared tin on top of your wood stove, when you have a good fire in the fire box. 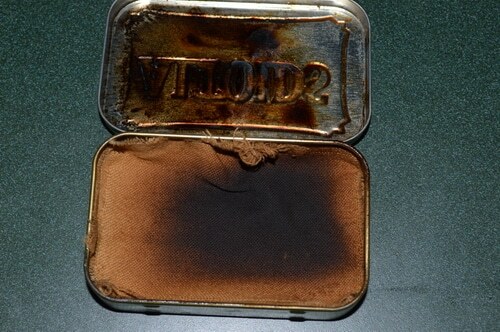 After an hour or so the altoids tin heats up enough to begin the reaction. The reaction takes several hours. When it’s done you’ll have carbonized cotton squares – char cloth. 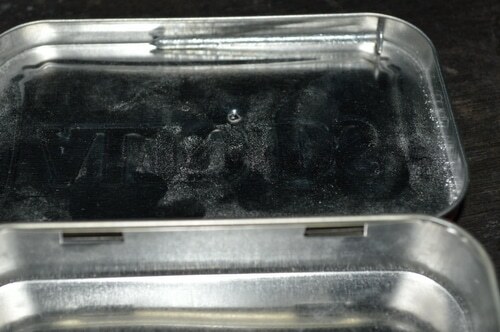 After about 4 hours, I remove the altoids tin from the stove top and let it cool and check the reaction. But don’t open the tin while it is still hot. The sudden influx of oxygen could set the contents of the tin on fire, if it’s still smoking. When I see that the bottom fabrics are dark brown, I flip the altoids tin on its lid and complete the charring on the other side. This takes about 3 or 4 more hours, depending on how hot you keep your woodstove. Periodically check for colour. You are looking for blackened fabric throughout. If it is black in the centre but dark brown to tan on the edges you need to cook it for a little bit longer. 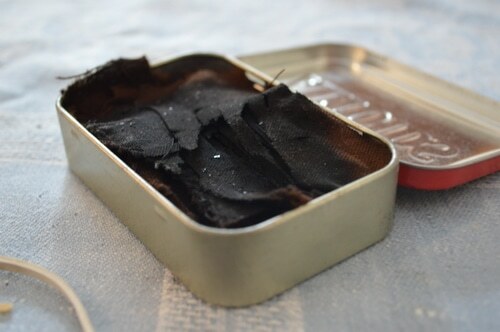 When you are finished, transfer the char cloth to a new altoids tin and put it in your 72 hour kit bag with a fire flint, and some tinder. I put dryer lint and some post it notepads in another altoids tin for the best fire starter kit. You can also pick up packaged tinder for your emergency kit. Over the winter, while your woodstove is going you can make quite a bit of char cloth. But use the same precautions making char cloth as you would with a lit candle. Don’t leave the house with your box of char cloth on the top of the wood stove, and don’t go to bed with it in process. I take mine off the top of the fire box overnight and put it back on in the morning, just to be on the safe side. Use a flint and striker to catch a spark on your piece of char cloth. Feed the char cloth spark with a little dry grass, cotton fluff, or other flammable, light fuel. Once that catches fire place a bit of dry kindling on top and you’ll have fire you can feed with wood to keep it going for cooking or warmth. Alway use fire carefully and wisely and never leave a burning flame unattended. Supervise children carefully around open flames. Learning to start a fire without matches is an essential homestead survival skill. Char cloth is the best fire starter in these situations. When I make char cloth it is completely fireproof. I use a tin, poke a small hole on top of lid with a small nail. I remove about 20 seconds after the smoke stops and seal the hole with the same nail. I let it cool completely before opening the tin. I can NOT even get it to burn holding a lighter directly on it! I thought maybe the material to begin with could have been treated with a fireproof chemical (not on label) so I tested if it would burn before charring it: went up in flames instantly. Is there a way to do this on top of your stove or in an oven, I do not have a fire place. There is but I haven’t tried it on the stove top. There are tutorials on you-tube that use the stove top method. This is super interesting. I’m going to show it to my boys and have them try some. I have a friend from Kenya who used to make charcoal to sell to pay his school fees. You never know how valuable skills like this can be. That’s so cool. I love that these basic skills can still help people. You can also use the same technique to make charcoal from willow sticks for drawing. But it is a little trickier on the stove top. That one I would do inside the fire box.